I currently have a Dell Inspiron 530 (motherboard 0RY007) with Windows Vista Home Basic (32-bit) installed on a 250GB Hardrive and a 2.2GHz Intel Celeron 450 processor. I have already upgraded the RAM from the stock 2GB to 4GB Crucial RAM. My current BIOS is 1.0.18. I am wanting to add an SSD to the computer (I purchased a 240GB Intel 530 SSD) and keep the current HDD for file storage. Since my computer doesn't have a Restore Disk or partition, I want to upgrade from Windows Vista Home Basic (32-bit) to Windows 7 Home Premium (32-bit), but install the OS on the solid state drive. I was wondering what steps I needed to take to make this possible. I noticed on the BIOS settings I can use IDE or RAID. Do I need RAID if I plan to use the SSD for the OS and programs and the HDD for file storage? Since you have a Vista license, you would need to purchase a Windows 7 upgrade license, which you can get for under $100. If you follow the Windows reinstallation guide (link below), it explains everything you need to know to install Windows 7. You do NOT need to install Vista first, as explained here. I have already purchased a full version of Windows 7 Home Premium (32-bit). Before installing the SSD, I put switched my settings for IDE to RAID through the BIOS (with the HDD still intact) and noticed that my computer will be in an endless loop from the BIOS screen then to a black screen stating Windows could not boot up (I have to select the to either start up normally or launch the repair tool). Once I go back to the BIOS and revert the change, things run normally again. This makes me more nervous installing the SSD. Will the SSD and HDD work together in IDE mode? I was told since I was going to use the two storage media's at once, I should disconnect the HHD first, and then install the SSD through RAID. Once I do that, I have to boot put in the Windows 7 installation DVD and boot from the optical drive to install the OS. After doing that, then I can re-connect the hard drive. This makes me more nervous installing the SSD. Will the SSD and HDD work together in IDE mode? Yes, they will work together in IDE mode. Acronis TrueImage will clone over the existing Vista installation to the SSD and then upgrade it. Afterwards, you can use a free utility called EasyBCD to set up a startup multiboot menu. 1. With the system off, unplug your HDD and install the SSD. 2. Boot to the BIOS and change the controller mode to RAID. 3. 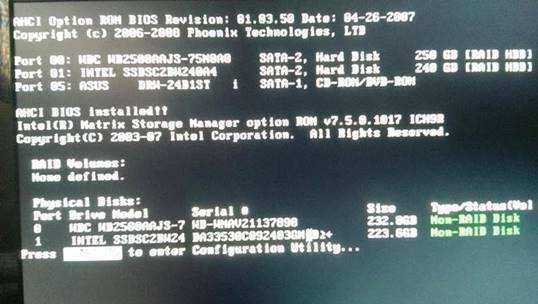 In the BIOS, set up the boot devices to remove your HDD and add the SSD and other drives you might want to boot from (DVD, flash drive). 4. Also in the BIOS, make sure the SSD is the only bootable hard drive. 5. Boot to your Windows 7 disc and install the OS, updates, drivers and apps. 6. Plug your old drive back in. Both drives are now visible in the BIOS and you'll see your HDD in disk management and Explorer when you boot Windows. *I did not perform any actions, I just left the menu once I saw that. When I reboot the computer again and perform no actions, I get this second screen. Pen drive without operating system. Remove Pen Drive and Reboot. No boot device available. Press ENTER key to retry. I am only able to boot into Windows 7 (with the updates and programs I have installed) when I hit F12 and manually choose to boot from the SSD. You do not want to create a disk array, so you should select the appropriate option in the Matrix Storage Manager. 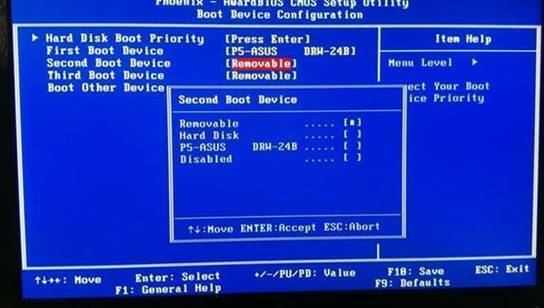 You did not change the boot device options in the BIOS, so go back and do that. Here are some pictures for reference but your BIOS is going to look a bit different. Before I do anything with the RAID through the Intel Matrix Storage screen, I want to make sure I am doing everything right. I know that our BIOS screens will show different options, but some of the options you tell me to select do not appear. For the Boot Device Configuration screen, my SSD does not appear on the list for any of the four options, I only have the Hard Drive labeled. This options pops up, whether I have the Hard Drive connected with the SSD, or just the SSD on its own. When you told me to make sure I only have the SSD and other devices available to boot from, these are my options, I cannot remove my HDD (which is option 3) from this list. When I have both drives plugged in, the black screen I get before the system enters the Intel Matrix Storage screen. The screen says ACHI BIOS installed, but when I access that screen to try to enable it, it only gives me IDE or RAID to choose from. I have tried the registry edits that I found online, but no results. I don't know what exactly I need to do from the Intel Matrix Storage screen to remedy this, but any help is greatly appreciated. This is my first time doing anything like this. You seem to have the SSD in port 1. I would move it to port 0 and put your HDD on port 1. Then the default hard drive selection in the BIOS should be the SSD. The boot order will be DVD, hard drive, and whatever else you need to boot from. 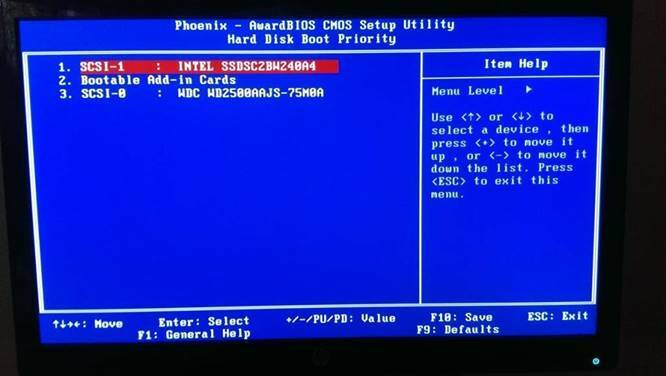 The hard disk boot priority should be Intel then nothing else. In other words, only the SSD will be bootable. You don't need to do anything in the Intel RAID utility. It's fine just the way it is.